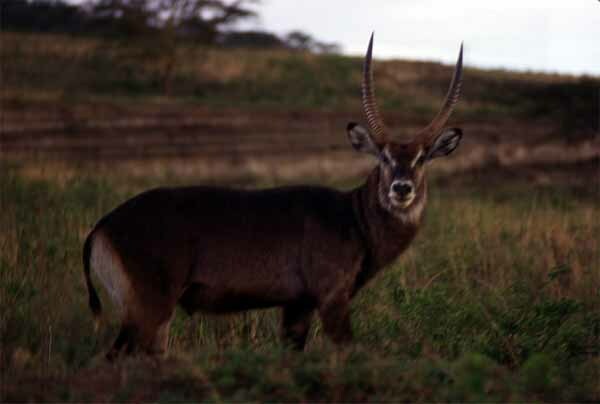 The waterbuck (Kobus ellipsiprymnus) is a large antelope four feet (1.2 m) high at the shoulder, and about 400 pounds (182 kg). Its heavy set appearance derives partly from the wiry, thick grey-brown pelt. Only males have the long, heavily ringed, scimitar shaped horns, which curve upwards and backwards to a length of two feet (60 cm) or more. They're fairly common antelopes, not necessarily retricted to water, like this one which was photographed outside a protected area on the road to Nakuru, Kenya.